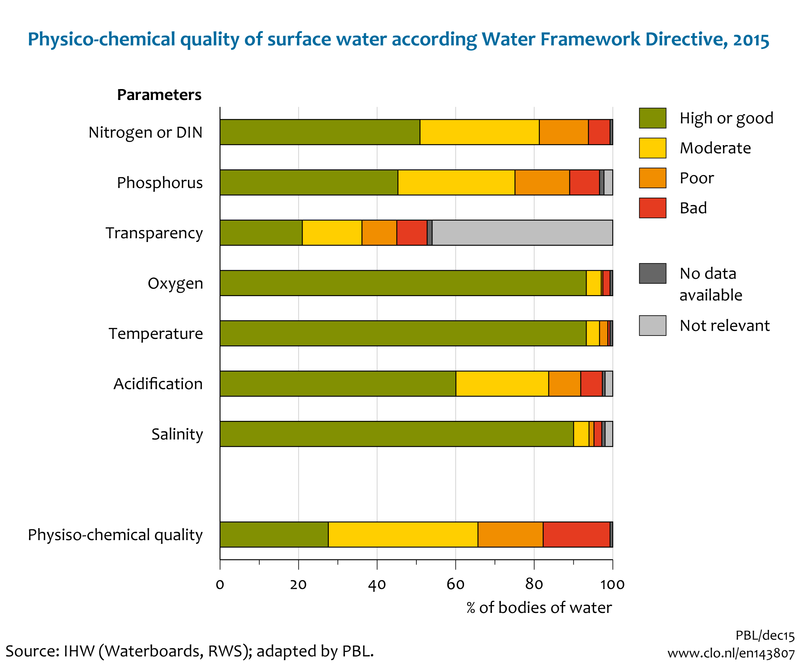 Most water bodies do not meet the quality requirements as laid down in the European Water Framework Directive (WFD). The chemical quality is in most water bodies insufficient. The ecological quality ranges from moderate to poor. This is the result of the biological evaluation and the presence of various substances. Link to the interactive chart water quality where the quality elements and the biological and physico-chemical parameters can be selected. Throughout the Netherlands, the ecological quality level ranges between moderate and poor, the label 'very good' is not assigned. The biological quality of 34 bodies of water is good, but only 3 of them a good ecological quality. Nitrogen and phosphorus are the components with the highest number of waterbodies that does not meet the standard.. In nearly half of the bodies of water in the Netherlands, the chemical quality level is adequate. The chemical quality is based on 33 substances or group of substances specified on the European level. This will be increased to 45 substances in 2021.
high concentrations of persistent substances due to emissions in the past. The evaluation of the chemical condition and the other relevant substances is not sufficient, due to the presence of persistent substances or emissions from the past decades. Overfertilization with the nutrients nitrogen and phosphorus. These chemical elements cause algae growth. Water management. Most streams have been straightened and the banks leave very little or no room for the natural habitats of plants and animals. The banks of most lakes and channels are armoured with rocks, making it impossible for ecosystems to develop. The water level is nearly always controlled, which limits the dynamics of the natural environment. The presence of pumping stations and dams. Fish can hardly migrate. Fish passages are constructed to improve this situation. Pesticides cause large-scale death of water flea populations. The parameters with the highest number that does not meet the standard or a good quality are phosphorus, nitrogen of the physico-chemical quality element, zinc of the river basin specific pollutants and fluoranthene of the chemical status. In the interactive chart water quality maps of the quality elements and the parameters of the biological and physico-chemical quality are available. The map of the water boards can be selected. IenM, 2015. Stroomgebiedbeheerplan. Rijndelta. Ministerie van Infrastructuur en Milieu. IenM, 2015. Stroomgebiedbeheerplan. Maas. Ministerie van Infrastructuur en Milieu. IenM, 2015. Stroomgebiedbeheerplan. Schelde. Ministerie van Infrastructuur en Milieu. IenM, 2015. Stroomgebiedbeheerplan. Eems. Ministerie van Infrastructuur en Milieu. Gaalen, F.W. van et al. (2016), Waterkwaliteit nu en in de toekomst. Eindrapportage ex ante evaluatie van de Nederlandse plannen voor de Kaderrichtlijn Water, Den Haag. Puijenbroek, P.J.T.M. van (2014), De kwaliteit van het Nederlandse oppervlaktewater beoordeeld volgens de Kaderrichtlijn Water (KRW), PBL, Den Haag. MNP (2008). Kwaliteit voor later. Ex Ante evaluatie Kaderrichtlijn Water, Milieu- en Natuurplanbureau, Bilthoven. Evers, C.H.M., Knoben, R.A.E., Herpen, F.C.J. v., 2012. Omschrijving MEP en maatlatten voor sloten en kanalen voor de Kaderrichtlijn Water 2015-2021. Stowa, Amersfoort. Molen, D.T. v. d., Pot, R., Evers, C.H.M., Nieuwerburgh, L.L.J. v., 2012. Referenties en maatlatten voor natuurlijke watertypen voor de Kaderrichtlijn Water 2015-2021. Stowa, Amersfoort. Puijenbroek, P.J.T.M. van, Cleij, P., Visser, H., 2014. Aggregated indices for trends in eutrophication of different types of fresh water in the Netherlands. Ecological Indicators 36, 456-462. Puijenbroek, P.J.T.M. van, C.H.M. Evers, and F.W. van Gaalen. 2015. 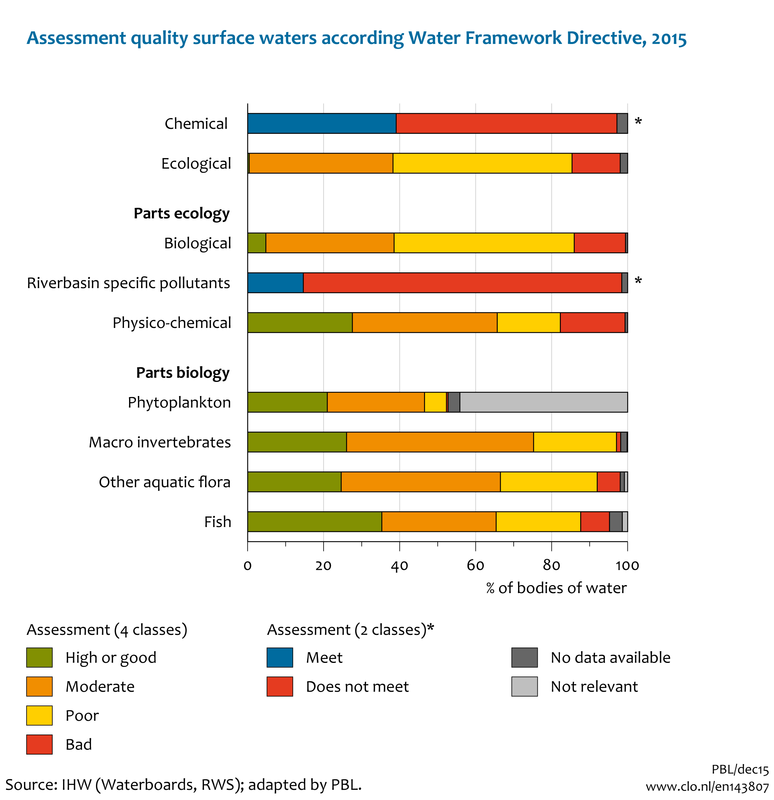 Evaluation of Water Framework Directive metrics to analyse trends in water quality in the Netherlands. Sustainability of Water Quality and Ecology 6:40-47. CBS, PBL, RIVM, WUR (2016). Quality surface water, 2015 (indicator 1438, version 07 , 12 January 2016 ). www.environmentaldata.nl. Statistics Netherlands (CBS), The Hague; PBL Netherlands Environmental Assessment Agency, The Hague; RIVM National Institute for Public Health and the Environment, Bilthoven; and Wageningen University and Research, Wageningen.